Produced by Joe Taft (Veritas Sports Editor/Web Editor) and Kaylee Ellis (Veritas Staff). On Friday, October 23, Spirit Week wrapped up with Class T-Shirt Day and the annual Fall or Homecoming Pep Rally. 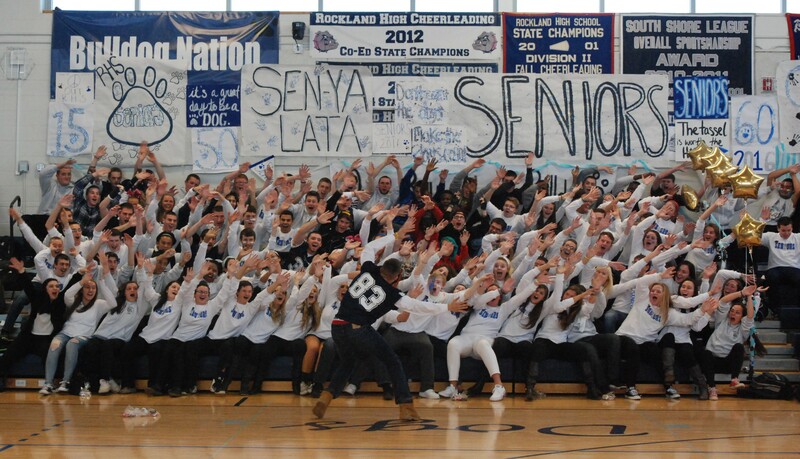 The playful junior class vs. senior class rivalry was evident at the rally during the student favorite “Roller Coaster” contest. Junior, Matt Dunn and Seniors, Russell McCauley and Stephen Norris led their classes in the famous Rockland High School cheer. Teachers Chad Bigsby and Amanda Lanigan were crowed Mr. and Ms. Rockland after being voted for by RHS students. See below for a photo gallery of the day’s events. Photos by Michelle Downey. Chad Bigsby and Amanda Lanigan were crowed Mr. and Ms. Rockland after being voted for by RHS students. RHS Cheer performed during the rally. Project Pumpkin fun for all! The RHS Student Government held the annual Project Pumpkin for the children in Rockland on Sunday, Oct. 25. The Veritas was there! Seth Rosczewski captured many of the sights and sounds digitally while Carolyn McCarthy, Jill Donahue and other staff photographed the student government members in their diverse costumes as they provided candy and entertainment for the trick or treaters. Also available was a haunted hallway and many activities in the gym including a jump house, face painting and games. Below are Seth’s video and Carolyn’s photo gallery. Enjoy! Ryan Sugrue, Haley Macray and Adam Royle. Sydney Wells & Maddie Cedrone watch the trick or treaters pass by. 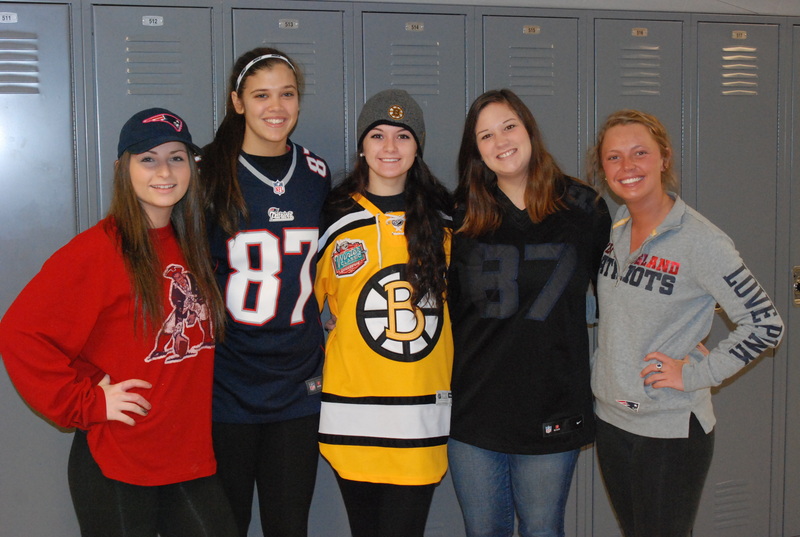 On Thursday, Oct. 22, Rockland High School Students continued to show their school spirit with Favorite Sports Team Day! Stay tuned for more pictures from Fall Spirit Week. Want your photo to be featured? Submit it to hmacray2016@rocklandschools.org! Abigail Kinlin with her parents, Keith and Katie Kinlin. photo by Carolyn McCarthy. Chosen by members of the RHS senior class, Abigail Kinlin is the new Miss Rockland for 2015. 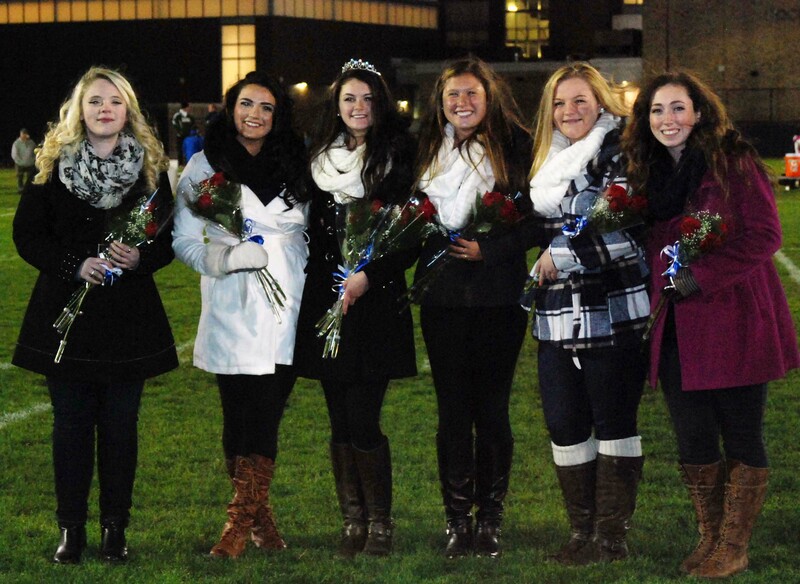 Kinlin was crowned at half-time of the Homecoming Game on Friday night, Oct. 23. Also honored during the ceremony were the other five senior nominees, Haley Macray, Caitlin Yannizzi, Ashley Pezzella, Lexie Carchedi and Kiera Tobin-Rosman. Below are Veritas photos of the girls and their parents. 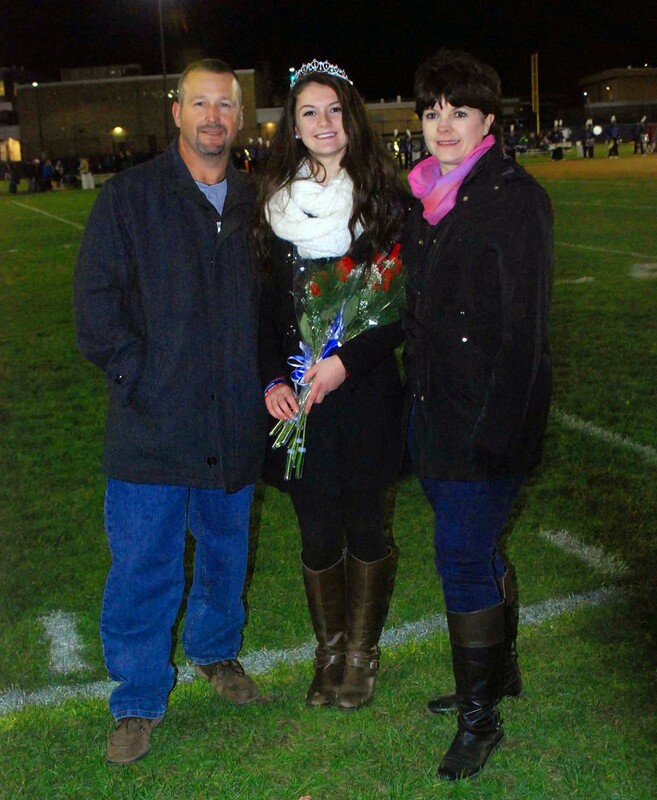 Lexie Carchedi is accompanied by her parents, Steve and Debbie. Be sure to see our next Veritas print edition for more information including interviews with each of the girls. 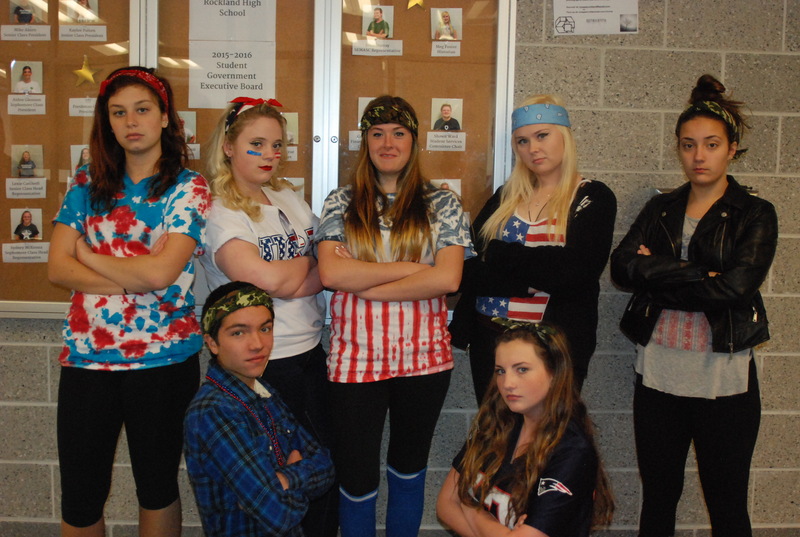 On Wednesday, Oct. 21, Rockland High School Students continued to show their school spirit with American/Camo day. Up next: Favorite Sports Team Day! At the annual Mr. Rockland pageant held at RHS on Wednesday night, senior Zach Pransky took home the crown. The event was hosted by seniors Carly Reardon, Caitlin Yannizzi, Kiera Tobin-Rosman, and Haley Macray; and organized by junior Finance and Fundraising committee chair Colleen McCarthy. Asked after the event, Pransky was at a loss to explain why he won. Two of his opponents cited his dramatic reading and his responses to the Q&A. Seasoned judge and chemistry teacher Ms. Hoyo said it was the toughest competition she has ever judged, alluding to the fact that she has judged many competitions in the past. She and the other judges Mr. Damon, Mr. MacAllister and Mr. Liquori took quite a while to deliberate who the winner was. Pransky believed his opponents, Mark Ewell, Ryan Sugrue, Billy Parlee, and Michael Ivanoskos, were all deserving of the award, possibly more than he was. The unexpected appearance by Dr. Cron in his ducky costume, during contestant Mark Ewell’s performance, was a hilarious addition to the pageant. Tuxedos for the formal wear part of the contest were sponsored and provided by Merian of Brockton. For taking first place, Pransky was awarded a $250 scholarship, a front parking spot, a Chipotle gift card, a ride in the Rockland Veterans Day Parade, and ultimate bragging rights. A complete video of the event will be available through wrpsrockland.com later this week. Check the next print edition of The Veritas for complete coverage. Photos below are by Veritas staff member, sophomore Megan Lund. Judges included Samantha Hoyo, Rich MacAllister, Nick Liquori and Fred Damon. Judges Ms. Hoyo and Mr. MacAllister listen intently as Zach Pransky performs his reading of “Tiny Glowing Screens, Part 2” a poem originally performed by George Watsky. Veritas Staff Photo.